Shrimp is one of the easiest proteins to cook in a smoker. It requires a bit of preparation before smoking, but not a tedious task. If you aren’t looking forward to peeling and deveining your shrimp, just buy fresh or frozen, cleaned, raw shrimp. Because the cook time is relatively short, I recommend using a Masterbuilt Electric Smoker. I have found that smoking shrimp on a charcoal smoker cooks the shellfish unevenly because of some spots being hotter than others. That might just be my rather old school smoker that uses offset, indirect heat. That being said, the smoke from charcoal is pretty tasty on shrimp. So, use the smoker you have and just keep an eye on the shrimp. You are looking for the color to just turn to an opaque pink. It is easy to overcook shrimp. 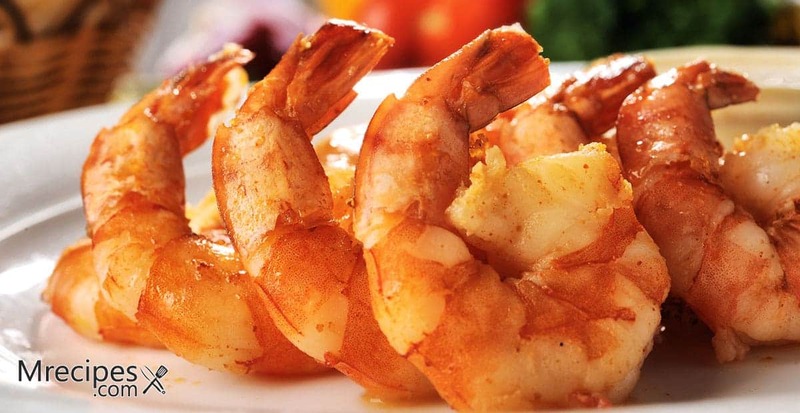 You’ll find two delicious smoked shrimp recipes below. First one is smoked cajun spiced shrimp and the second one is smoked greek style shrimp. I’ve included a recipe for smoked cherry tomatoes and greek olives at the bottom of this page. It makes a great side dish with the shrimp. The recipes here are for a dry smoked preparation and a wet smoked preparation. The results are very different, but equally tasty. In another recipe for shrimp skewers I let the shrimp be a stand-alone appetizer. With these recipes I suggest pairings for the shrimp to allow each dish to be a complete entrée. I recommend smoking the shrimp in a disposable aluminum foil pan, or two. 1. If frozen, defrost the shrimp. Peel and devein the shrimp if not already prepared. Pat the shrimp dry. 2. Combine the dry ingredients in a jar with a lid. Shake until all the ingredients are mixed well. 3. Coat the foil pan, or pans, with either butter or olive oil. Place the shrimp in the pan. Spoon as much of the dry rub over the shrimp, as needed, to coat it. Any extra dry rub will store fine if you don’t use it all. Toss the shrimp to coat both sides. Put the pan aside while you prepare the smoker. 4. Prepare the smoker by adding wood chips to the tray and water to the bowl. Preheat the smoker to between 225°F and 250°F. Open the top vent. 5. When the smoker is up to temperature, squeeze 1/2 the lemon juice over the shrimp and place the pan in the smoker. Cook for 15 minutes. Give the shrimp a stir. Cook for another 15 minutes until the shrimp is an opaque pink. 6. Remove the pan and squeeze the rest of the lemon juice on the shrimp. Add the parsley and serve on a platter with grits and a salad. A couple of nice side dishes for Cajun spiced shrimp are cheesy grits and a bitter greens salad. You can make these while the shrimp is smoking. Serve the shrimp right on top of the grits. This recipe is really nice with the addition of smoked cherry tomatoes. I recommend starting the tomatoes approximately 45 minutes before the shrimp in the smoker. 1. Prepare the smoker by adding wood chips to the tray and water to the bowl. Preheat the smoker to between 225°F and 250°F. Open the top vent. 2. If frozen, defrost the shrimp. Peel and devein the shrimp if not already prepared. Pat the shrimp dry. 3. In a large bowl, mix together the EVOO, butter, and lemon juice. Allow to cool. Stir in the garlic, oregano, parsley, and salt. Add the shrimp and toss to coat evenly. Place the shrimp in the pan or pans with all of the sauce. 4. When the smoker is up to temperature, place the pan in the smoker. Cook for 15 minutes. Give the shrimp a stir. Add the feta cheese on top and smoke for another 15 minutes until the shrimp is an opaque pink and the cheese is a bit melted. 5. Remove the pan from the smoker and place the shrimp and all the pan juices on a serving platter or bowl. Drizzle with EVOO and serve with lemon wedges and side dishes. For this dish I recommend serving the shrimp with either a simple couscous or a lemony rice pilaf and smoked cherry tomatoes. The recipe for the tomatoes is below. As with the shrimp, a disposable foil sheet tray works well for this recipe. 1. Preheat your smoker to between 225°F and 250°F. Add water to half full in the bottom bowl. Add wood chips to the side tray. 2. Rinse the tomatoes off in cool water and allow them to dry on paper towels. 3. Place the tomatoes in a single layer on the sheet pan and coat with EVOO, salt, and pepper. 4. Smoke for 45 minutes. Add more wood chips and water at approximately 45 to 60 minutes. Continue to smoke while the shrimp is smoking. 5. Remove the pan of tomatoes from the smoker and stir in the olives while the tomatoes are still warm. Serve with the shrimp and grains.